Мезина Е. В., Петросян Х. Ф. Drilling With Casing // Молодой ученый.  2012.  №6.  С. 40-42.  URL https://moluch.ru/archive/41/4912/ (дата обращения: 20.04.2019). Drilling-with-casing system eliminates the need to trip pipe and bottomhole assemblies (BHAs), increasing drilling speed and reducing risk exposure by always having casing on or near the bottom. This system simplifies well architecture by potentially reducing the surface casing size as well as contingency casing strings or liners. A casing string or liner can be eliminated by successfully drilling into or through a pressure transition or lost zone. As reservoirs age, drilling hazards ranging from depleted zones with pressure transitions and hole stability problems become more prevalent. These issues add to an estimated 10 to 20 percent or more to drilling time. Additionally, conventional methods used to control lost circulation such as mud additives, pumping cement plugs, cementing, and resins can be time consuming, costly, and often ineffective. Instead of fighting these archaic problems with archaic treatments, this technology improves drilling efficiency and ultimately reduces costs by analyzing drilling problems and engineering fit-for-purpose solutions for clients to effectively solve these problems. a rotate the casing at surface system incorporating an Internal Casing Drive System and a drillable “cement in place” drilling BHA. A top drive system is used to rotate the casing, which remains in the hole at all times and is eventually cemented in place when the appropriate depth is reached. Special equipment is needed to handle the wireline-retrievable BHA; a split crown and split traveling blocks facilitate wireline access to the top of the casing through a wireline blowout preventer. A wireline unit sufficient to run and pull the BHA is also needed. Weatherford International Ltd.'s Drilling with Casing (DwC™) utilizes a drillable bit that is made up onto the casing. When TD is reached, the casing can be cemented into place by pumping through the bit. If the hole must be deepened, the bit is designed to be drilled through to continue conventional drilling. Reduced mud and cementing costs due to smaller wellbore diameter. The casing drilling process eliminates the conventional drillstring by using the casing itself as the hydraulic conduit and means of transmitting mechanical energy to the bit. A short wireline retrievable bottom hole assembly (BHA) consisting of at least a bit and expandable underreamer (Fig. 1) are used to drill a hole of adequate size to allow the casing to pass freely. but it also provides a torque indication if the underreamer drills undergauge. Centralizers on the casing stabilize it within the borehole and prevent wear on the couplings. The BHA generally consists of a pilot bit and underreamer, but may include other tools needed to perform almost any operation that can be conducted with a conventional drill string. The pilot bit and underreamer pass through the drill-casing and drill a hole that provides adequate clearance for the drill-casing and subsequent cementing. Conventional directional tools (bent housing positive displacement motors, MWD tool, and isolation models) and LWD tools can be suspended below the drill casing shoe for directional drilling. 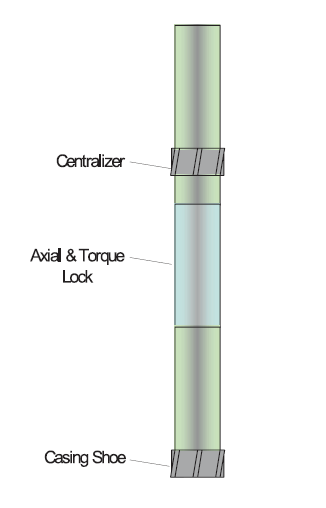 A conventional core barrel can be run for coring. In many ways designing a well for Casing Drilling is similar to designing a conventional well. One significant difference is that the casing is subjected to additional stresses while Casing Drilling, so buckling, fatigue, and hydraulics deserve special attention. In 2011, Ukhta Burenie, the branch of «Gazprom Burenie», tested a new drilling with casing technology on Bovanenkovskoye oil and gas-condensate field. The principle of this method is drilling in Ø324 mm surface casing using Ø393.7 mm OD Defyer™ Drill Bit threaded on the first joint of casing. The bit blades are made ​​of titanium-aluminum alloy and equipped with the PDS cutters. Well drilling and casing operations are performed simultaneously without the need for drill pipes or any round-trip operations. The casing serves as a conduit for drilling mud circulation and as a means to transfer torque to the bit. The new technology was tested with the use of Weatherford equipment. Now the new drilling method has already been applied on four wells of Bovanenkovskoye oil and gas-condensate field within the 0-450-meter interval when drilling in 324 mm surface casing string. The target depth for casing setting was achieved during the testing operations on well Nos. 6314, 6321. Drilling rate was maintained at design parameters. Based on the preliminary calculations of «TyumenNIIgiprogaz» specialists, application of this technology can result in financial savings of about 4 million rubles per well, increase of drill pipe and equipment service life, as well as reduction of well construction time approximately by two days. The Casing Driling system may eliminate costs related to purchasing, handling, inspecting, transporting, and tripping the drill-string, reduce hole problems that are associated with tripping, and save on rig equipment capital costs and operating costs. Casing Drilling system has been used in more than 500 well intervals to drill more than 460 000 meters with casing since it was introduced in 1999. Based on the knowledge gained to date, the CDS in its current state of development is well suited for drilling softer formations with casing sizes of 7” or larger. In these situations, the penetration rate can easily match conventional rates, and the reduced tripping and drillstring handling can be used advantageously. Prior to apply casing drilling in any particular well, the hole condition, such as unscheduled events and litological characteristics of the formations have to be examined in order to evaluate the design criteria of the casing and to improve drilling performance. Adam T. Bourgoyne Jr., Keith K. Millheim, Applied drilling engineering, First Printing Society of Petroleum Engineers Richardson, TX 1986. Fisher, A., Reid, D., Zo Tan, M., Galloway, G.: Extending the Boundaris of Casing Drilling, paper IADC/SPE 87998, presented at the IADC/SPE Asia Pacifi c Drilling Technology Conference and Exhibition, Kuala Lumpur, Malaysia, 13-15 September 2004. Fontenot, K., Highnote, J., Warren, T., Houtchens, B., (2003): Casing Drilling Expands in South Texas, paper SPE/IADC 79862, presented at the SPE/IADC Drilling Conference, Amsterdam, The Netherlands, 19-21 February 2003. Lyle, D., Duey, R., Perdue, J.M., Rasheed, W., Bradbury, J., Lang, K., (2002): Casing Drilling : Saving time, saving money; A supplement to: Hart’s E&P. Mason, C.J., Lopez, J., Meling, S., Munger, R., Fraser, B. (2003): Casing Running Challenges for Extended-Reach Wells, paper SPE 84447, presented at the SPE Annual Technical Conference and Exhibition held in Denver. Shepard, S.F., Reiley, R.H., Warren, T.M., (2001): Casing Drilling: An Emerging Technology, paper IADC/SPE 67731, presented at the 2001 SPE/IADC Drilling Conference, Amsterdam, The Netherlands, 27 February – 1 March, 2001. Tessari, R.M., Madell, G., (1999): Casing Drilling – A Revolutionary Approach to Reducing Well Costs, paper SPE/IADC 52789, presented at the 1999 SPE/IADC Drilling Conference, Amsterdam, Holland, 9-11 March 1999. Warren, T., Houtchens, B., Madell, G., (2003): Directional Drilling with Casing, paper SPE/IADC 79914, presented at the SPE/IADC Drilling Conference, Amsterdam, The Netherlands, 19-21 February 2003. Warren, T.M., Angman, P., Houtchens, B., (2000): Casing Drilling: Aplication Considerations, paper IADC/SPE 59179, presented at the 2000 IADC/SPE Drilling Conference, New Orleans, Louisiana, 23-25 February 2000. Основные термины (генерируются автоматически): SPE, IADC, BHA, CDS, PDS, MWD, LWD. 1. Rotary Steerable Drilling Systems Directory.